The industrial trailer tow quick disconnect is the most rugged slinky cable we carry. 15ft RCA Premium Cable pefect for RV installation! This tow harness allows you to quickly connect and disconnect your trailer or 5th wheel from your vehicle. You can use this for any vehicle at all that needs a connection and disconnection. The cable slinks down to 12" and can stretch to over 60" if needed. It's very easy to use and totally weatherproof. Perfect for anybody who wants a wired backup camera system and is towing a vehicle. The Quick Slinky cable connects to the monitor cable on one side and the camera cable on the other. 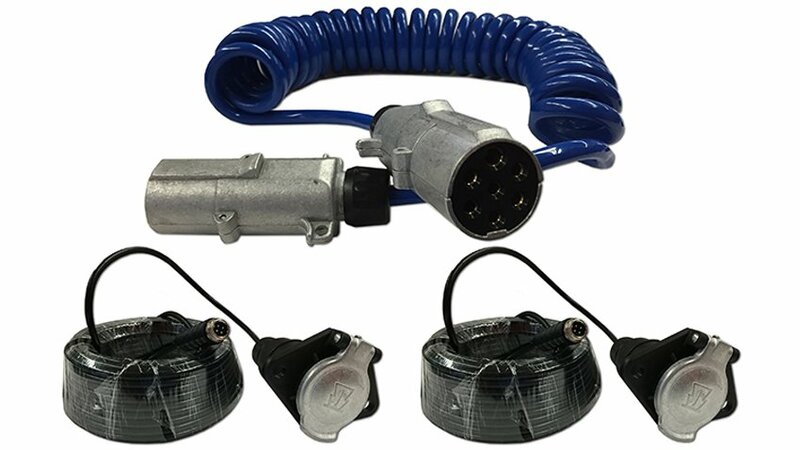 This Kit includes all three cables needed for the backup camera system. You can also add up to 4 cameras using the same Quick Disconnect. This cable is Industrial Duty as well. So you will have one of the most weatherproof and strongest cables on the market. This is the Ultimate in Disconnect cables, there is nothing stronger. The Monitor Cable is 15ft, so you have plenty of slack to reach your disconnect point. You can upgrade this to 30ft or more if you need more slack. The Camera Cable is 70ft, so you have plenty of slack to reach your camera from the disconnect point. You can upgrade this to 75ft or more if you need more slack.